"Teaching both the funk theory and 50s bebop jazz theory (chordal tones, pivotal b5s, chordal structures/movements, ear training, substitutes, extended triads, grooving, etc. 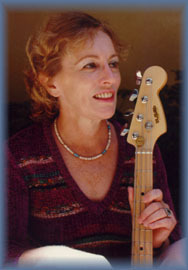 for complete exposure for soloing, fills, all styles) -- professional teaching using time-proven materials, yet practical and fun to learn -- proven successful bass teaching since 1969 (between 3-4,000 students, many who became famous pros). Guaranteed no boring note-scales, non-workable odd stuff, all with a goodly amount of reading and chart interpretation expertise taught easily too, the studio musician's way which quickly works well and easy to comprehend and use. Funk-Soul-Latin/Jazz, Pop, Jazz (including the finer walking and soloing), and 16ths Motown, paradiddle licks, Gospel, Blues (all styles) and techniques for recording work, establishing a groove, working with combos and big bands, reading charts, making up lines, backing singers, bands, soloists and yet playing a good solo yourself without putting people to sleep. Sorry, I do not take beginners unless you've had a lot of music on another instrument first. Only someone serious who has been playing for at least 1 year+. Will take occasional out-of-towners for a lesson -- a little higher price for just one lesson. Free music book supplied with 1st lesson. Bring your bass, cord, and a blank tape to record the lesson each time --very intensive study -- you won't be bored, you will get exercises, cycles, chordal theory, etudes for ear development, a few basic scales (held to a minimum), arpeggios, usable lines immediately as we tackle all styles of music with material you'll use. We also work on good time. Attitude: Have an open mind. We do discuss what you want vs. what I think you need. Poor techniques quickly and easily corrected -- there is no need to hurt anywhere while playing -- it's all in technique. Just practice at least 45 min. a day consistently. Am teaching in home studio, app't must be made either via email or voice mail phone. And lesson times must be adhered to or 24 hr. notice given to postpone/change lesson times. My music teacher was an Eastman graduate who taught Howard Roberts, Oscar Moore, etc. and I have taught music personally since 1949 stopping to do the busy LA studio work 60s, and taught elec. bass since 1969 -- my materials used by many famous accredited music schools world-wide, my video courses and books/tapes are endorsed by 10-yr Pacific Jazz Festival award-winner famed educator Joel Leach (music head at Cal-State Northridge) and Jazz/Studio Sax Legend Plas Johnson ("right stuff" - he's the"Pink Panther"). " Some former students include Dave Hungate (Toto, famous Nashville producer/bassist), John Clayton (who then played elec. bass with the Count Basie band in 70s), most of the string bass pros in LA who switched to elec. bass, Bill Laymon (takes Casady's place w/Jefferson Airplane), Reinie Press ("Aquarius"), Alf Clausen (composer of Simpsons TV Show), Charles Meeks, Lane Baldwin, Mike Porcaro, Roy Vogt, Pat Putter Smith, others and my 20+ tutorials have influenced Sting, Abe Laboriel, Mo Foster, Joel DiBartolo, John Paul Jones, Tiran Porter, Stu Hamm etc. Voted #3 elec. jazz bassist in many music magazines mid-70s, was #1 60s recording bassist-- records, TV shows and movies etc (see website)."